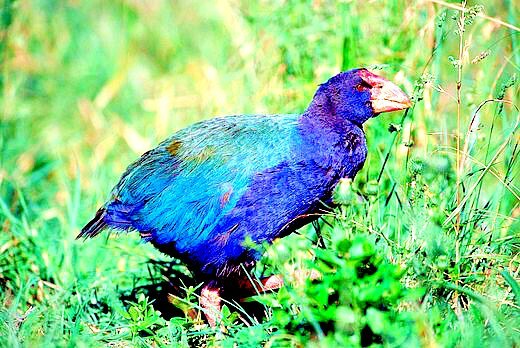 Takahe, rare, flightless New Zealand bird, related to the rail and gallinule, once regarded as extinct, it was rediscovered in 1948. Turkey-sized, it has a heavy curved bill, a reddish shield on the forehead and bright blue-green plumage. Length: up to 63cm. Family Rallidae; species Porphyrio hochstetteri.